While I always appreciate lotions (especially Delectable!) I was very underwhelmed with everything else. 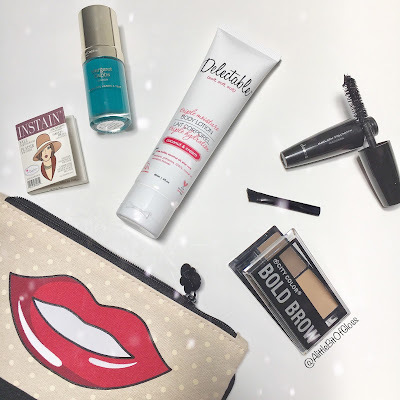 I rate the June Ipsy Glam Bag a reluctant 2/5. City Color Cosmetics eyebrow powder- Full disclosure, I'm a bit of a Benefit snob when it comes to brow products...more specifically a Benefit KaBrow fiend. I could talk all day about what I love about Benefit products but I'll save that for another day *hehehehe! * I tried so hard to find something I liked about this City Colour powder, but I couldn't for the life of me lie to you like that. I needed to use so much of this powder for it to show up and it doesn't have the lasting power that I'm used to. I'm sure this might work for someone looking for barely there brow makeup, but if you're looking for proper pigmentation and brows that last then this product isn't for you. theBalm Cosmetics powder blush- I do love a good blush but I've gotten so many from Ipsy over the past year. I rate this blush as "just ok". I do like the formula and pigment of theBalm products. They're also fantastic for popping in my travel bag or purse :) I really like that this blush can also double as an eyeshadow...BONUS! Doucce mascara- Again...I'm not sure why Ipsy keeps sending me things I don't need, but I've gotten so many mascaras I can't use them or give them away fast enough. I was happy to note that this mascara didn't smell like plastic and the brush was higher quality than some of the other mascaras I got from Ipsy. I can't wait to see what Ipsy has to offer next month and I'm hoping a redemption is in the cards since this month was a bit of a dud. What did you get in your June Glam Bag? I'd love to hear from you!